Lately, the timeline of my life has been sharply divided into two distinct parts: before and after. Before I became pregnant. Before I became separated. After I lost my baby. After I left my husband. When I make the effort to contemplate all this becoming, losing, and leaving I almost always end in the same place that I started: my pregnancy. I have a room in my house that I very rarely go into. It is the would-be nursery that is currently packed with so much junk that I can barely step foot in there. This evening I ventured into that room for the first time in months. I was searching for an extra bobbin for my sewing machine and figured it might be in there among the chaos. 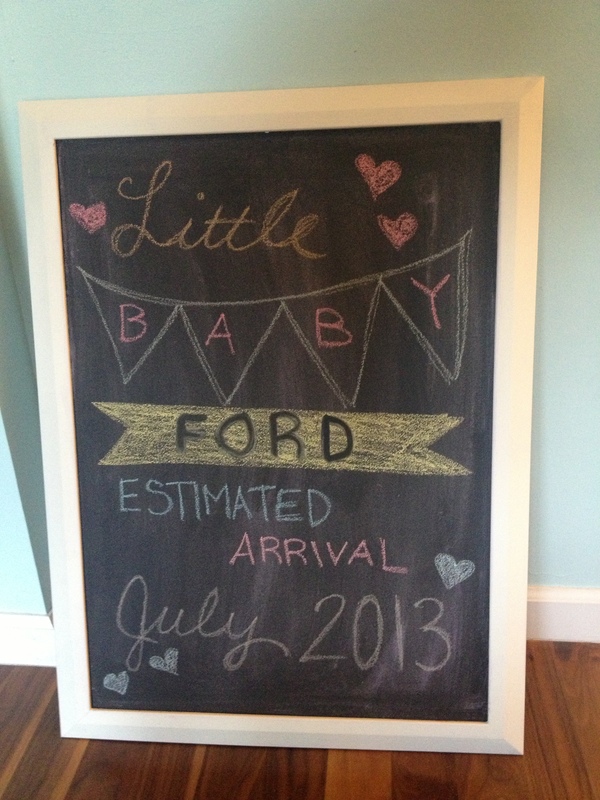 Upon opening the door, the very first thing that my eyes land upon is the chalkboard that I made to document my pregnancy. It’s the prop I used to tell my Mom that I was finally bearing her a grandchild. It’s the picture that I sent to my BFF to share the amazing news. It was my project–built with my own two hands–that I intended to use to document my growing baby. It was intended to be the constant–the inanimate object by which to judge the growth of my bump; to compare my baby’s size in-utero to various fruits; to simultaneously count-up the weeks until I was to give birth while counting down the weeks until I held my baby in my arms; and to finally welcome her home. I find myself wondering how it’s even possible to miss someone who I knew for such a short period of time. How one can possibly become so attached to someone so intangible. I think it’s because I already knew her before she was even conceived. I have dreamed and fantasized and created her in my mind so long ago that it was really only a matter of time before my body caught up with my fantasy. When my body finally welcomed her into existence it was as if my mind could breathe of sigh of relief that she had finally found her home. Tonight my home feels vacant and hollow. Her presence, one that was already so abstract, now feels like a ghost that will forever haunt my memory. I don’t know why I never erased that chalkboard. It’s been frozen in time, stuck inside a room that I can’t bring myself to commit to any other purpose. I just can’t seem to let go. I see everything through the lens of my loss. Even my relationship with The X–I feel tethered to him because he was the other half of that life that grew briefly inside of me. And I wonder if that’s the only reason that I am holding on to a possible future with him. I decided not too long ago that in one year from now, when I turn 31, I was going to try to have a baby on my own–IVF with donor sperm. But the truth is, I don’t want that. What I want is the whole experience of creating another life with a man who I know and that I love. I want to look at my child and recognize features and personality traits because I am already intimately familiar with those traits that came from their father. When my child smiles, I want my heart to already be acquainted with that asymmetry. Or when my child excels at reading and writing, I want it to because their father has spent every night reading to her from the books he loved as a child. Or when my child develops a stubborn romantic streak, I want her father to recognize his own father in those sentiments. And when the father of my child looks at me, I want to see the love, respect, admiration, and connection in his eyes for me–the mother of his children–the love of his life. I’m not ready to settle just yet. I’m giving myself time to find all of that and hopefully, more. Through my grieving, I am learning that the reason this is so difficult for me to get over is because for a moment in time, I had everything that I wanted. And I think the only way to truly overcome that grief is to allow for the possibility that I can have it again. Not the same baby, not the same man. But, the same me. Only, hopefully a more actualized, satisfied version of me. The X and I decided that it would be a good idea to try dating one another throughout this separation. To see if there is still something here. To see if we could find that one tiny spark buried beneath the hurt, anger, and indifference. To see if dating one another would be that little puff of oxygen that could feed that spark and return it to the flame that it once was. We have both changed so much over the past 10 years, exponentially so in the last year alone. I don’t think that either of us recognizes the other any longer. But we are both clinging to hope that maybe, just maybe, the people that we have become could love each other like the people we used to be. So on Friday we had our first date. And it really felt like a first date. I came home, showered, and got all dolled up in the hopes that I could make a good first impression. After all, they say you only have one chance to make a good first impression. I suppose that also applies to re-dating your ex-husband. I was full of nerves and my stomach fluttered like butterflies. I was overcome with anticipation of seeing him again, but for the first time. Like any other date, I wondered if we’d have chemistry? Would we have anything to talk about? But also feared that this would truly mark the end–that my first impression would be my last. That he wouldn’t like me any more than the last time we said goodbye. We met for drinks. Him, a martini. Me, a dark and stormy. I ordered the caprese salad. He ordered the beef tar tare. One of the things that The X didn’t like about me while we were married was my picky palate. I’m simply not adventurous when it comes to food. I decide by looking at something whether or not I want it on my taste buds. It used to drive him crazy the way I would turn my nose up at anything that looked weird to me. So when he asked if I wanted to taste his tar tare, I said yes. He spread a little bite on the bread, sprinkled it with salt, and then sprinkled it with pepper despite knowing how I despise pepper. I gave an inch and he took a mile. But I smiled and silently accepted his dare. I knew it was a test and all I had to do in order to pass was the put the tar tare sprinkled with pepper in my mouth and swallow it. Somewhere, in the deep recesses of my mind, I think I thought that this one bite of raw beef would make him like me again. I tried to like it. I really did. But I failed when he handed me the napkin in which to spit it out. and ends with the moment following their first date. Jamie begins with the first date and struggles forward through the relationship. only as silent objects, props for a focus, or to provide a hint of what once was, or could have been. Why do people grow apart? Does success for one mean loss for the other? Suffice it to say that this might have been the worst idea I’ve ever had. Of course we both took something away, but the take-away wasn’t nearly as enlightening or progressive as I thought it might be. Instead, we were both left with an overwhelming sadness over the demise of our marriage. Could I have been more understanding? Could he have been more supportive? Or was it the other way around? One line in particular really caught my attention–“Why do I have to lose because you can’t win?” As we sat in the small, dark theater and watched a fictional version of our marriage unravel right before our eyes, that one simple line seemed to sum everything up. But, really, in the end it just makes us both losers. No one wins because we no longer have each other. It’s just so sad. We both cried quite a bit during the play. There is one scene on their wedding day (the only point in the entire play where the actors are on the timeline) that really touched us both. We sat there, hand in hand, as we watched ourselves in the actor’s faces say ‘I do’ and share their first dance as husband and wife. The tears were unstoppable at this point so we both just let them fall. We both expected to feel was a sense of grieving for what was, but in the end we were simply left longing and wondering where it all went wrong. By the time the play was over, I was entirely too emotional to go out in public, so we headed our separate ways. Me, to our empty home. He, to who knows where. That night I cried my eyes out over the immense sadness that riddles my heart. I sobbed for the profound loss of something that I have always held so dear. But in the end, I felt a flicker of hope that maybe this isn’t over after all. If there is still something there to feel, then maybe there is something there worth saving. For now, however, we’ve both agreed to let him plan our second date. Perhaps something that hits a little further away from home….